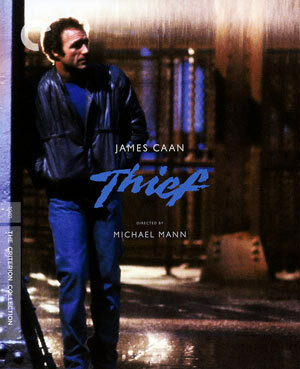 Thief is a solid crime-drama from Michael Mann and a wonderful performance from James Caan, perhaps one of the best of his career. The Blu-ray released by Criterion features brand-spanking new video and audio transfers and the features, while a bit limited in scope, are all well worth checking out. Note: This review contains spoilers about the plot. Please skip if you haven’t seen the film yet. 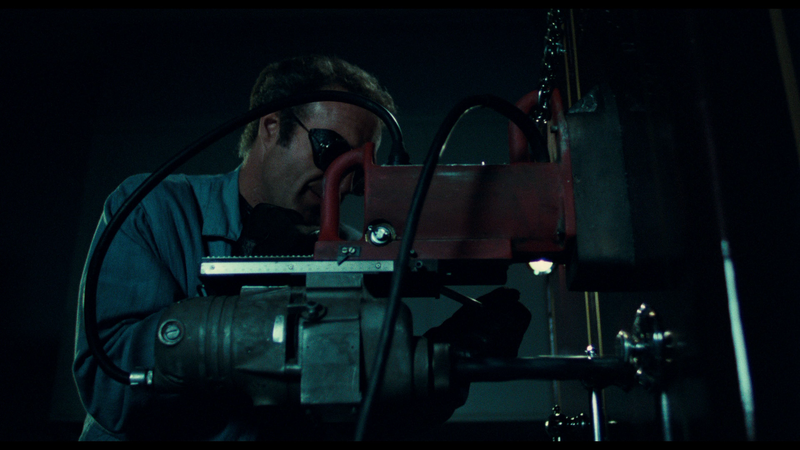 Following shorts and documentaries, as well as a TV movie, writer/director Michael Mann made his foray into feature film with 1981’s crime-drama Thief, a film that for new viewers will find kinship with the more recent movie featuring an anti-hero, Drive; its obvious Nicolas Refn was influenced by Mann in numerous ways. Thief centers on Frank (JAMES CAAN), a master safe-cracker with a slick crew consisting of alarms expert Barry (JAMES BELUSHI) and communications specialist Joseph (WILLIAM LAVALLEY). Frank is good at what he does and makes a solid living owning two business fronts with a car lot and a basic lounge. However, his life is incomplete and hopes Jessie (TUESDAY WELD) can fill in the holes to become his wife, buy a nice house and start a family. Speaking of which, the closest to family Frank has is mentor Okla (WILLIE NELSON) who is serving time though he is ill and asks Frank to get him out so he may die on the outside rather than in prison leading to one of the more amusing scenes in the movie. When Frank’s fence is killing and the $185,000 meant for payment is taken, Frank tracks down the culprit, a plating company executive named Mr. Attagila (TOM SIGNORELLI). At gunpoint, Frank gives Attagila 3 hours to come up with the money and at the meet, Frank is greeted a man named Leo (ROBERT PROSKY), a high-level fence for the Chicago mob. Leo gives Frank the money and also a lucrative job opportunity that could score $800k+ and after some initial hesitation, Frank agrees though acting basically as an outside contractor with Leo supplying the necessary equipment and bankroll. Initially, things go smoothly as the heist goes off without a hitch, and his personal life coming together, though Frank has a few problems ahead: 1) Leo isn’t such a trustworthy guy despite helping Frank not only get a child to adopt (he and Jessie were turned down due to Frank’s criminal history) and 2) Chicago police are as corrupt as hell and a few dirty detectives want their cut of a lucrative pie. Thief is one of those movies I had heard of, due to it being Mann’s debut, but never had the opportunity to view and colored me a bit surprised, but it’s a well made, finely acted crime-drama which has all the shades of Mann’s other works with some adjustments as his career progressed and his techniques refined. What’s striking about this one is the visual style showing off the gritty and dark Chicago streets as well as giving us a character who isn’t the best guy yet, as with De Niro’s Neil McCauley in Heat, we as the viewer root and care about. For James Caan, after taking lead roles in several forgettable movies (and a downright terrible one) following supporting roles in The Godfather films, Thief easily features Caan’s finest performance and perhaps still his best to date, or second to his portrayal of Paul Sheldon in Misery. I do wonder how he, and the film as a whole, didn’t garner any award buzz, although looking at the awards history, Tangerine Dream’s score, which today is fairly well received, did get a Razzie nomination. 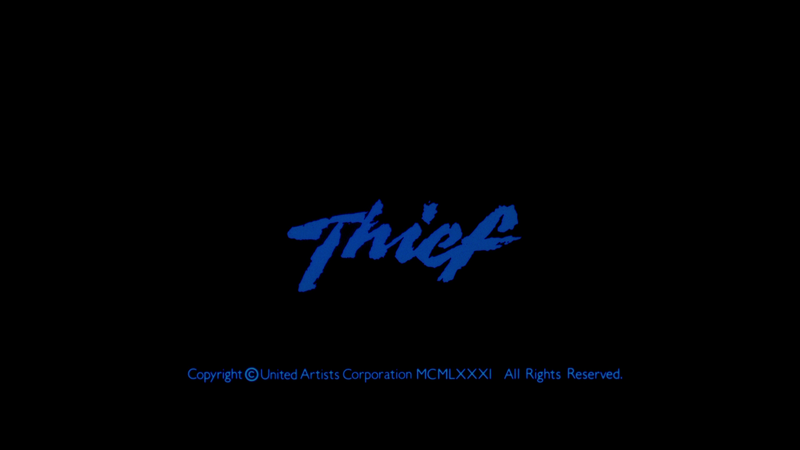 On the whole, Thief is one of the more unheralded and unheard of gems that, thanks to Criterion’s Blu-ray release, hopefully will receive more attention in the coming years. 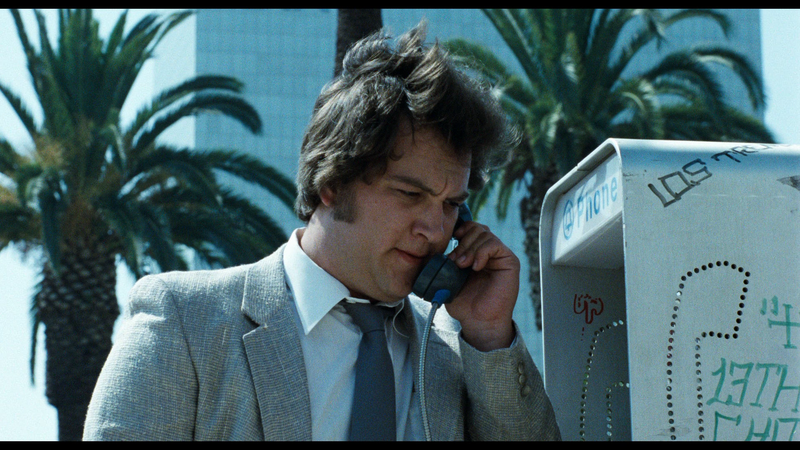 Is it the perfect film or meet the greatness of Mann’s Heat or even Manhunter? Not quite, but it does feature strong performances from James Caan and Tuesday Weld and also is the feature film debut of one James Belushi who, in a small part, shows some OK dramatic talent. The two-disc set comes housed in a standard clear Criterion Blu-ray case with the discs stacked and overlapping one another (the DVD on the bottom). Inside is a booklet with a nice essay about the movie and its themes. The DVD Copy contains all the features as well. 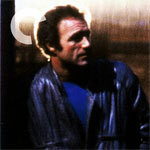 Audio Commentary – Recorded in 1995, this commentary finds writer/director Michael Mann and Actor James Caan chatting about the intricacies of the film and providing trivia about how it was made, the inspiration, so on and so forth. It’s a straight-arrow track and if you’ve ever listened to a commentary by Mann, it can be a bit dry, with more than a few gaps, yet at the same time so fascinating. There are newly recorded interviews with Michael Mann (24:18; HD), James Caan (10:39; HD) and Tangerine Dream (15:40; HD) (former member Johannes Schmoelling) discussing the movie 30+ years later. Each one of these is quite interesting and gives different perspectives with Mann’s being the most expansive. 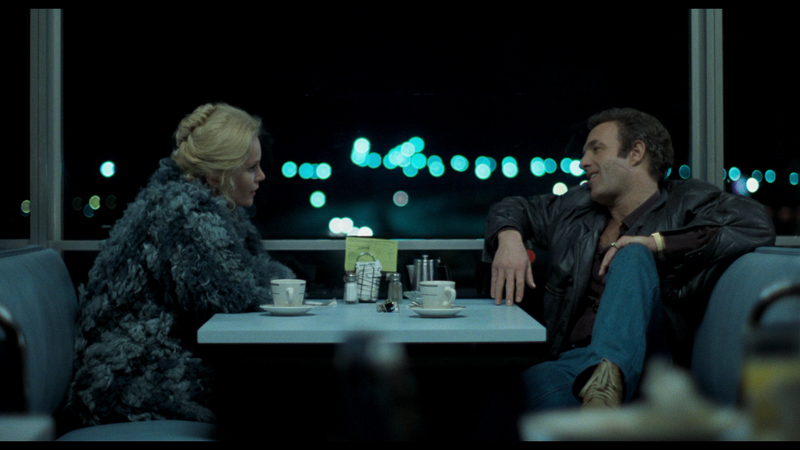 Debuting on Blu-ray courtesy of the Criterion Collection, Thief has never looked better. As explained in the booklet, and evidenced by the final product, the video transfer, shown in its original 1.85 aspect ratio, got a specific treatment removing dust, scratches and other imperfections but rather than just doing a quick and cheap scrubbing, it was meticulous and shows on the screen. Now, there are still very minor flaws where in a couple scenes a vertical blue line can be seen if you are closely looking, but it’s quite minimal. Save for that, the detail levels are good and there’s the natural film grain shows through quite well. Colors are well balanced though they tend to go towards darker elements. The movie includes an excellent 5.1 DTS-HD Master Audio track that, like the video, Criterion has upgraded from its original source. The dialogue levels are crisp and clear and ambient noises and other side action makes fair use of the front and rear channels, while the heavy action (like the finale) is centrally located and not quite as dynamic, though considering the age, still not bad. The highlight of this lossless track is, of course, Tangerine Dream’s iconic score even if does scream 1980s. Overall, Thief is a solid crime-drama from Michael Mann and a wonderful performance from James Caan, perhaps one of the best of his career. The Blu-ray released by Criterion features brand-spanking new video and audio transfers and the features, while a bit limited in scope, are all well worth checking out.